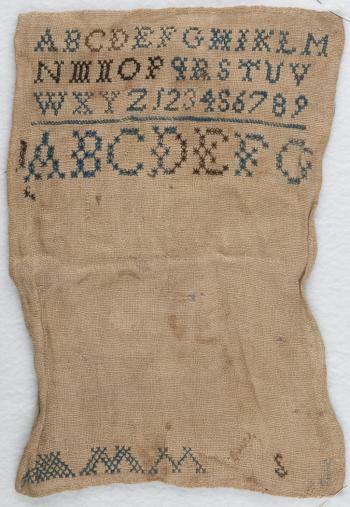 This sampler was donated to the East Tennessee Historical Society by a Fain family descendant. The Fains were a large, prosperous family, who were early settlers in Jefferson County. Many Fains appear on the rosters of the Salem Female Academy in Salem, NC, and the Odd Fellows/Rogersville Synodical College in Hawkins County. This simple marking sampler was left unfinished. It bears the initials S and J at the bottom right, but these may be a later addition.